Chill the serving glass. Shake all ingredients except club soda with ice cubes. Strain into the chilled glass and top with club soda. 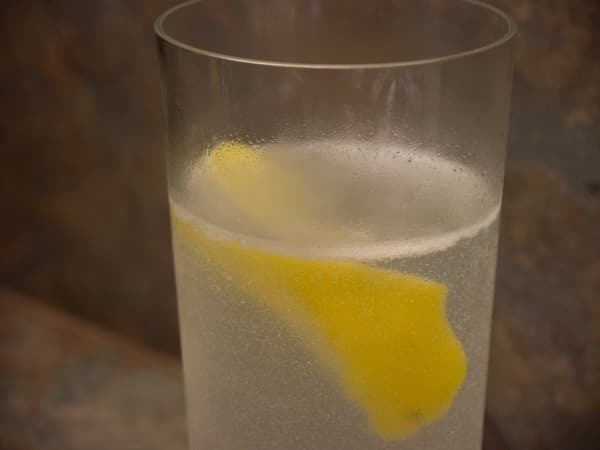 A Gin Fizz is a very nice, crisp and refreshing drink if you have some well charged water to fizz it with. What happened to Pellegrino? Was it always this flat? Or has it been about 10 psi all this time? It's good on it's own but for a Gin Fizz, more bubbles are required. More success can be had with bottled club soda or seltzer. This stuff usually has far more carbonation in it than mineral waters. You can try a siphon but I have had disappointing results with my ISI soda siphon. Even charging with two CO2 cannisters the soda starts losing it's pressure almost immediately. I read that there is a "safety" valve on these siphons designed for at home use. So no matter how many times you charge it the valve is always letting out the pressure you were counting on. The lawyers probably freaked out about a potential bottle explosion. You will notice I specify Old Tom gin. This is how a Gin Fizz was originally made according to the recipe from Harry Johnson. Also, we know this recipe predates London Dry gin. If you use Old Tom, cut back a little on the sugar as indicated in the recipe. For dry gin, add a smidge to the sugar. A garnish is not used for this drink but if you want an extra blast of citrus aroma use a lemon twist. In the The Savoy Cocktail Book the South Side Fizz variation is using "Gin" (which we will assume is Old Tom) with the addition of mint leaves. In the same book we also find the Alabama Fizz using "Dry Gin" - so London Dry - again with the addition of mint. In both variations you could muddle the mint leaves gently before topping with soda. Bear in mind that all drinks called Fizz's must be drank as soon as handed out, or the natural taste of the same is lost to the customer.